It seems like lately, I have had to fish three spots before I get on a good bite. Fishing on the Connecticut River and local ponds spoils me for when I go to Lake Champlain I think. The Connecticut River is fairly predictable on when and where the fish will bite so not as much time is wasted searching for productive waters. Lake Champlain fish tend to be more mobile and either make a large move bay to bay or a smaller move to a new area fairly regularly. The fish on the river are usually of better quality as well! On Lake Champlain today, the wind was relentless! Although there were fish there, it was very hard to fish them without some kind of wind break. The first stop of the day was very good a few days ago so we figured we should pop in and check out what has happened since then. After punching a series of holes spread out over a large area, it was time to check with the camera to see what was around. The second hole that I dropped down had a nice sized crappie laying face down right on the bottom. I grabbed my rod and attempted to catch it. Unfortunately, I could not attract that fish or any others for that matter. After seeing only perch and northerns we headed south to fish a nearby bay. There were a few people already fishing the second bay. At first, the fishing was slow. 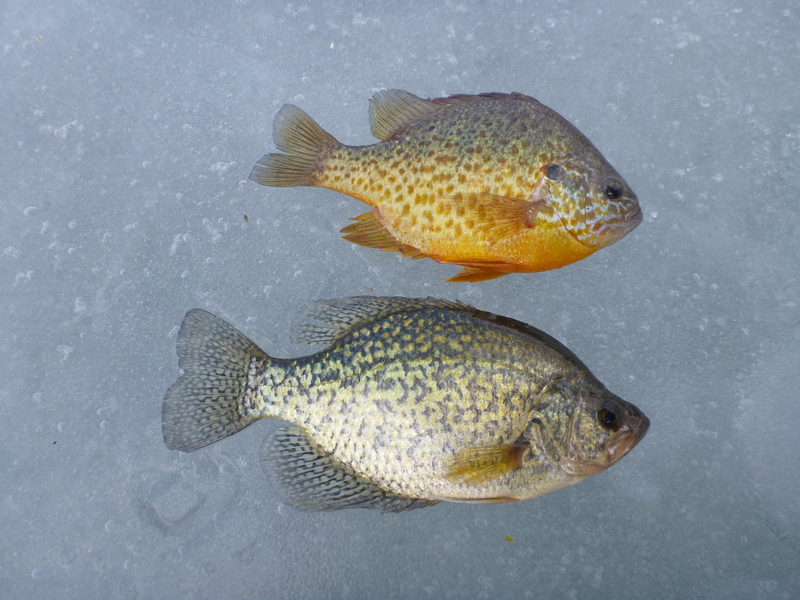 Only smaller perch were active and it was difficult to find pods of panfish. It took a bit of moving but eventually I was able to pull some fish. The numbers and size weren’t great but it was nice to be catching bluegill and pumpkinseed! The mixture of fish weighed heavily towards bluegill but there was a good deal of pumpkinseed and a few crappie mixed in. After a few hours of slow going, I packed up my gear and got ready to head even further south to hit my final spot for the day. 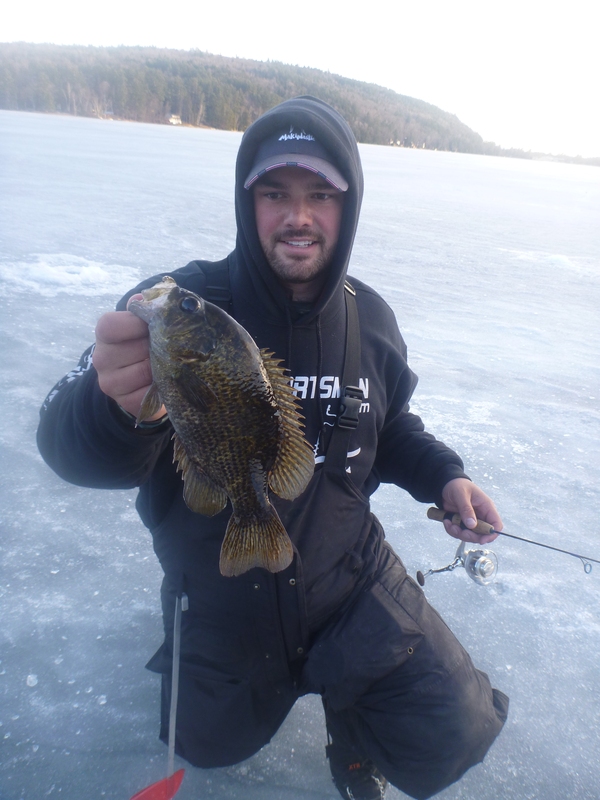 When I got on the ice it didn’t take long to start catching fish. There were lots of smaller fish but the big fish were there. The majority of the fish I caught were bluegill but most of the other guys were pulling pumpkinseed. I guess I could have moved to a different hole looking for the seeds but I really like trying to catch the light biting bluegill. I fished until 4:45 then decided to call it quits so I could make at least part of my drive home before it got dark. 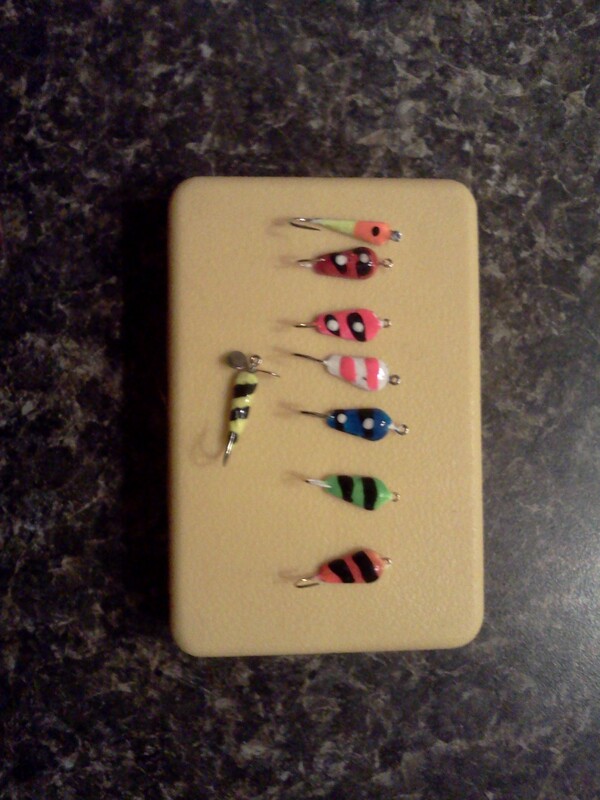 I used a bunch of different lures made my Bobby today. The color schemes and shapes worked well. Rockers, teardrops, and willows in a wide range of colors from light to dark… It didn’t seem to matter much once they were put near an active fish! Be on the look out for his post on jig making. It will be well worth your time! 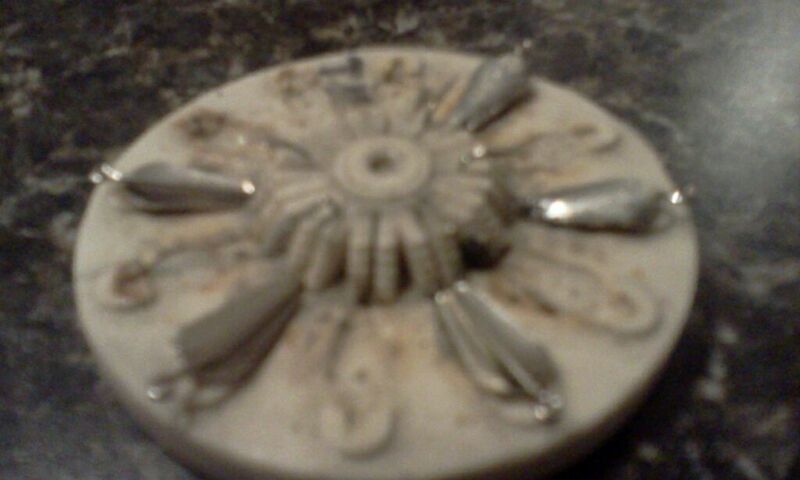 2-19-12 – Slow Day But Went Out With A Bang! 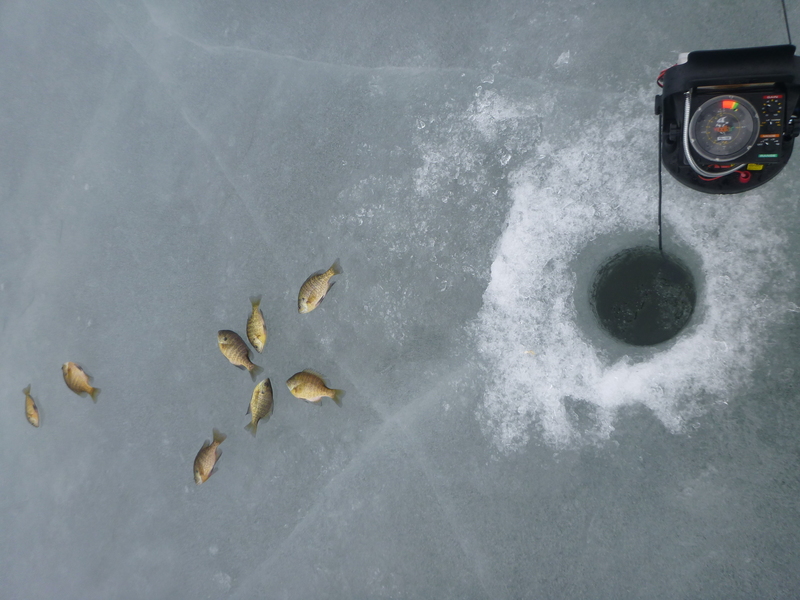 Hit the ice this morning bright and early looking to catch some crappies. We found them in decent numbers but they were all tiny. 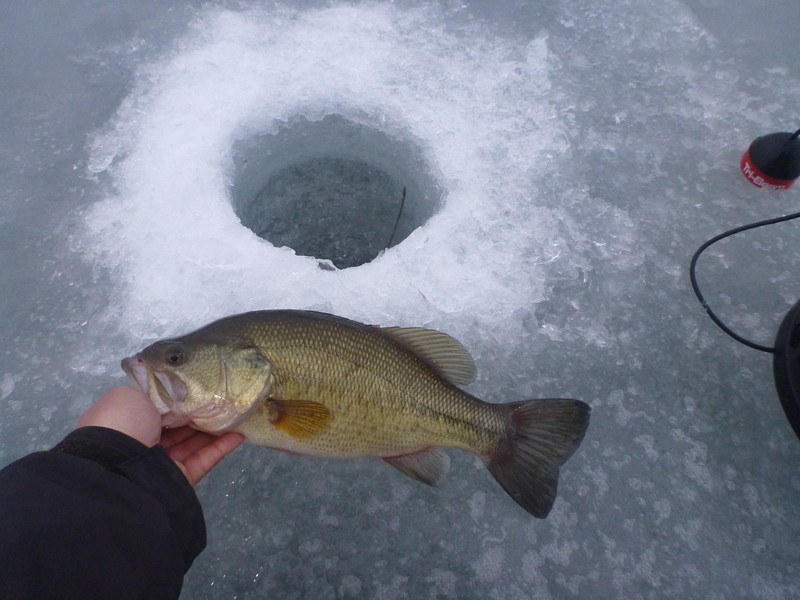 Managed maybe a dozen over 8″ out of the 51 that I iced. I kept just enough for a meal. There were lots of shiners and a few seeds mixed in today so it was frustrating. After 2.5 hours on the ice we called it quits and headed south. The next stop planned for the day was suppose to be the last. It didn’t work out that way though… The fishing was slow. After punching a bunch of holes we quickly realized that the only fish in the weed bed were tiny bluegill and pickerel. We cut out several other spots around the lake and were at a loss for a good idea after coming up empty. Past years and summertime fishing have had completely different results on that lake! We decided to head even further south in search of some good bluegill. I have been trying to avoid this inland pond because it has been real slow. When I got out on the water there were no fresh holes where we started so my hopes weren’t high. My buddy was punching holes while I followed with the Aqua Vu underwater camera. I was pleasantly surprised when I realized that every hole held fish! We quickly started fishing and had no problems staying on them for the remainder of the day. The best part of the afternoon was the crystal clear water. We were sight fishing in 7 feet of water. The depth we found fish at varied but it seems consistent to drop down around 4 feet before you would see one come in. They came as quick as we could pull them. 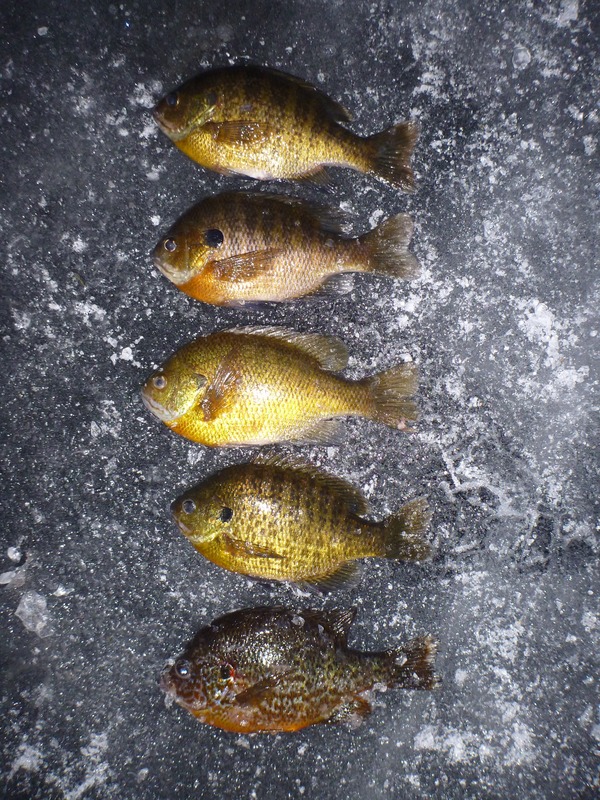 Lots of the bluegill were in the 8-9″ range and a few larger. Every time I saw a bass come in I tried to take my jig out to keep from catching them. Unfortunately, I realized some of the “bass” were rockbass after catching one… One of the fish I really wanted to catch! Tomorrow I will be going back to redeem myself for letting all those rockies get by! Stay tuned! The last two days I fished on Lake Champlain. The weather was amazing and it was great to be out there. I may have even gotten a tan! The bite was slower than it had been but I still did quite well. 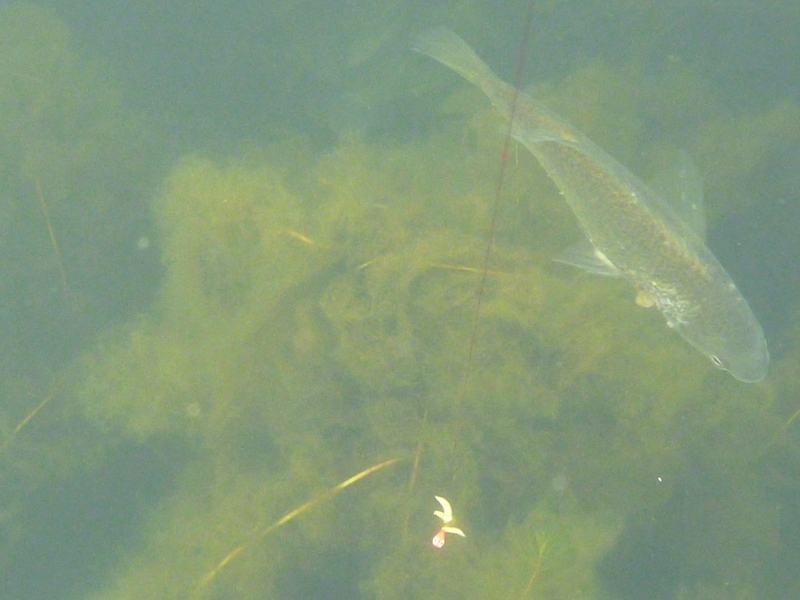 There were some quality pumpkinseed and plenty of hungry perch below me. 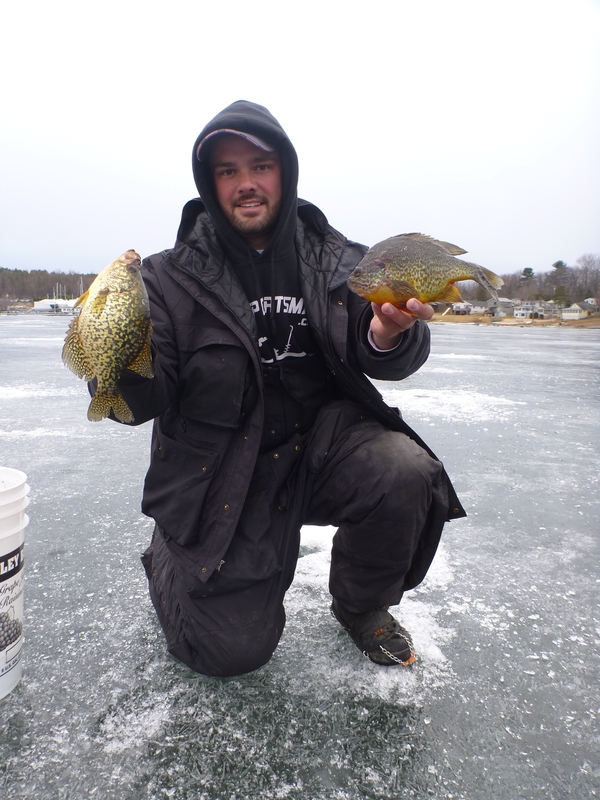 I managed to ice two decent crappie and lost a real nice one due to equipment malfunctions! Yesterday, I fished from 12 until 5. I was using the same set up presented in my 2-15 post. 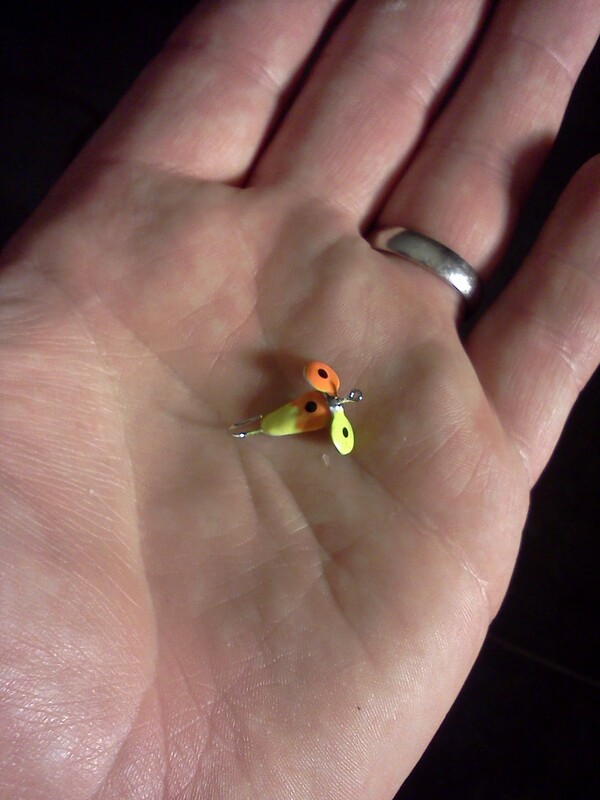 As a reminder, that was a chartreuse/orange tungsten jig tipped with a pink or red polli by Maki Plastic and a maggot. The fish were hitting it just as well as anything else that I could find so I went with it. 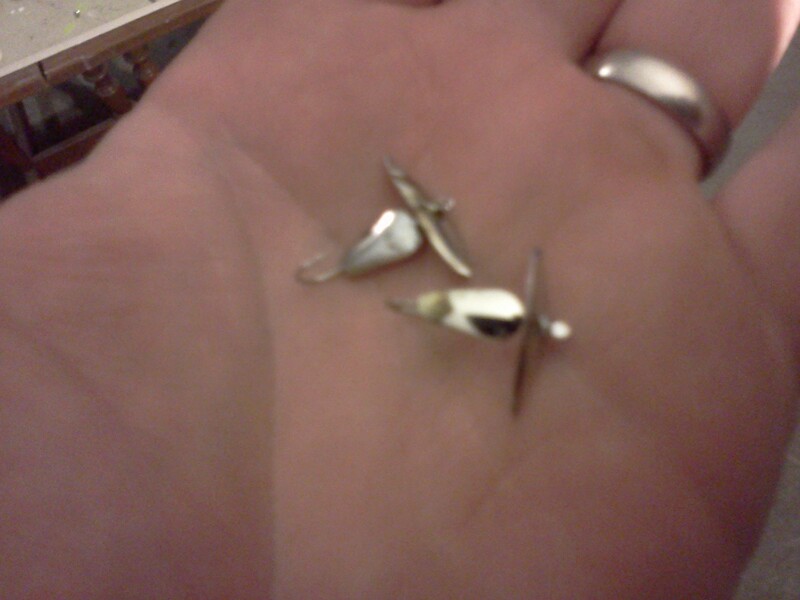 I like tungsten because it sinks so quick… It gets me back in the action fast. The biggest issue I find with it is that it is hard to fish smoothly. The best way to counteract this is to use a spring bobber as it slows the jigging action enough to have it entice the fish. 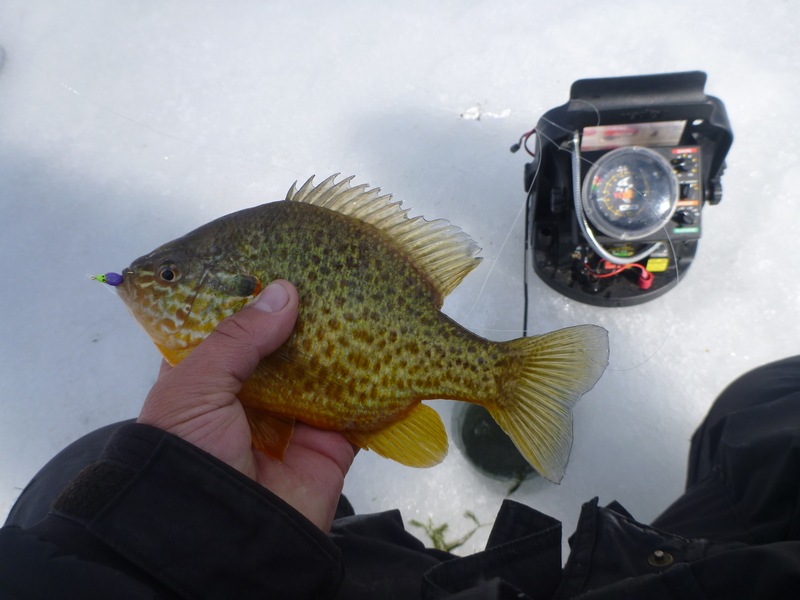 I ended up catching a bunch of pumpkinseed, a few bigger bluegill, and a loner 9″ crappie. Today, I got on the ice shortly before 6am. The fishing was slow until it was light out but it was a nice calm morning with no wind. Once the fish started biting it was good for quite a while. Whenever it did slow, I would use my Aqua Vu camera to find a hole where there were fish and try to catch them. Mid day, we had holes spread out quite a ways. Whenever the fish would disappear it seemed like you would find more on the far end. I put on some miles today! As for the big crappie that I lost today it was a disappointment! I was sight fishing in 9 feet of water. I checked my Vexilar and saw a fish coming in so I quickly looked back down into the hole. As soon as I found my jig, I watched it disappear so I started to raise my rod. 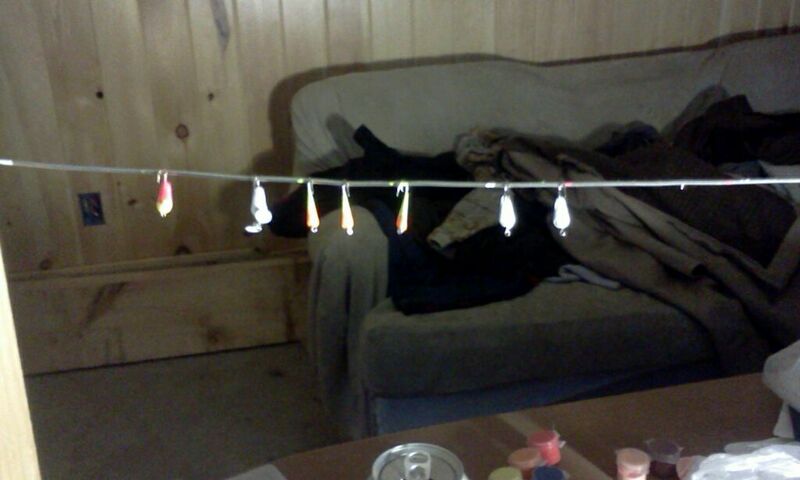 I saw a flash from a fish mouth so I set the hook. I felt the weight of the fish and it rolled sideways so I had a clear view of the whole thing. It was the biggest crappie I’ve ever seen! As I raised it to about the 3 foot mark I felt the tension release and the fish swam away. 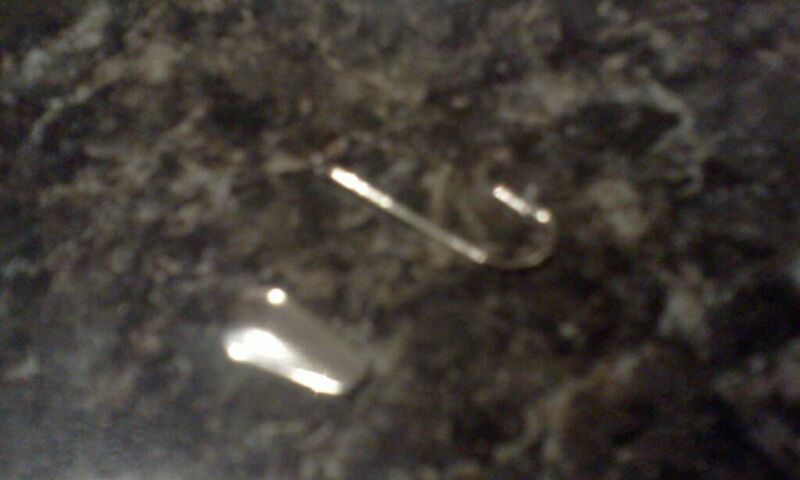 Upon inspection of my jig I realized the hook had straightened out. I guess that’s what keeps me excited to get out every day! Headed out tomorrow morning bright and early to the glory hole to see how things are going. Its been a while since I’ve been there. Not sure what the plan is for the afternoon but I’ll be on the water somewhere!